Fever blisters must run their course. There are commonly five stages of a fever blister. 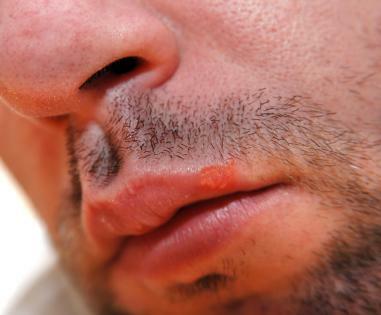 Fever blisters start out as small bumps that become painful blisters on the mouth and lips. They are caused by the herpes simplex virus 1 and are extremely contagious. Once a person contracts the virus, it remains dormant in the body until it is triggered, and a fever blister emerges. Some common triggers for fever blisters include a fever, cold, infection, stress, over-exposure to the sun and wind, menstruation, hormones, and decreased immunity. The first day or two, there will usually be no visible signs of a fever blister, but instead tingling, itching and burning at the spot it will eventually appear. The infection is contagious at this stage, so avoid close physical contact with others. A topical cream may start to be applied to the area to help control the spread of the infection and aid healing. How Long Is a Fever Blister Contagious? Sometime during days two through four, a blister will appear in the form of a cluster of small, painful bumps that multiply or become enlarged. At this stage, the body's white blood cells will start to fight the infection, and the fever blister fills with vesicle fluid, commonly known as pus. Day four is known as the ulcer stage. Among the stages of a fever blister, the ulcer stage is the most painful. A shallow fever blister will develop, which may surrounded by a red ring of inflammation. The fever blister will begin to dry out during days five through eight. A golden brown crust will form and a scab will appear. As the scab shrinks, it may crack and bleed, and itching and burning will persist. From days five through eight, the fever blister will heal and the scab will come off. There may be some dry flaking and residual swelling present, and the skin may remain slightly red or pink. Although fever blisters usually heal between eight and 10 days, some may take up to two weeks to go away. Avoid physical contact with others. Try not to touch the fever blister. Always wash hands thoroughly after applying medication. Examine what might be triggering outbreaks and avoid those triggers. Avoid trauma to the mouth by wearing protective gear when playing contact sports. Learn to manage stress through relaxation techniques such as yoga or meditation. Protect your mouth and lips from cold weather and wind. Use sunscreen and lip moisturizers to protect the lips and keep them moist. Drink plenty of fluids to hydrate the skin. Avoid contact with people who are suffering from cold and flu symptoms. Wash hands often to stop the spread of germs. L-Lysine fights the virus that causes fever blisters. Vitamin B-complex is effective in boosting the body's healing and immune functions. Zinc lozenges stimulate the immune system. Calcium and magnesium work together to fight stress. Echinacea, Goldenseal, Pau d'Arco and Red Clover may all be effective in treating fever blisters. Colloidal silver is a natural antiseptic and antibiotic. Approximately 80 percent of the population carries the herpes simplex virus 1, or HSV-1. Most people who develop fever blisters actually got infected with the virus in infancy or early childhood, usually from family members or friends. After the blisters from this initial infection heal, the virus goes into the nerve cells of the skin and lies dormant until something weakens the immune defenses and triggers the virus. By recognizing the initial stages of a fever blister, you will be able to treat it promptly.